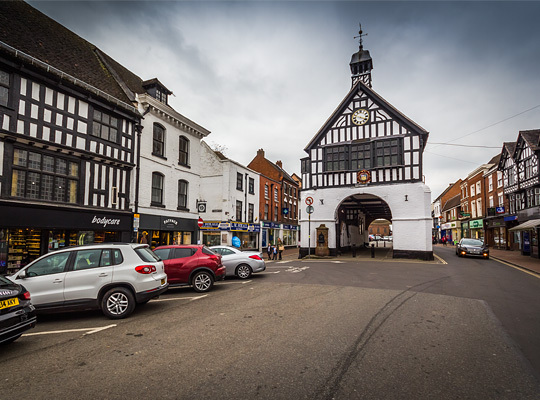 Previous proposals along similar lines had fallen by the wayside when, in 1849, the Severn Valley Railway Company was formed to forge a new route between Hartlebury and Shrewsbury in Shropshire, a distance of 40 miles. Its first Engineer, Robert Nicholson, carried out the survey. Six years later he was succeeded by John Fowler, engineer of the Oxford, Worcester & Wolverhampton Railway which had agreed to operate and maintain the SVR for a period of five years, although the OW&WR had become part of the West Midlands Railway by the time of opening. 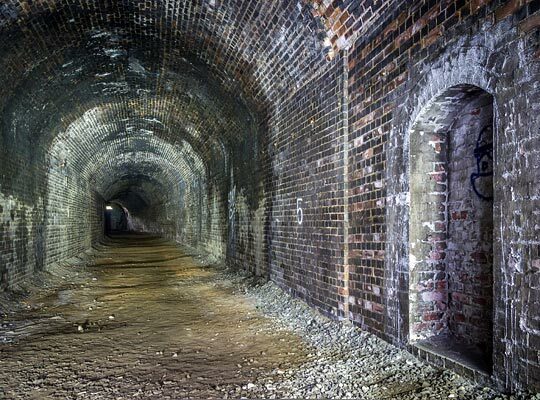 A bill for construction of the line received Royal assent in August 1853, the cost being estimated at £600,000. Difficulties in raising the necessary capital resulted in three subsequent Acts to sanction economies. 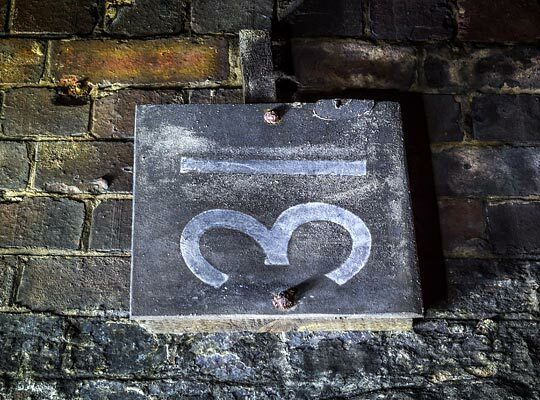 The scheme came close to abandonment before Messrs Peto, Brassey & Betts, the contractors, agreed to accept shares in the company as part payment for their work. The final scheme involved a single track with passing loops, although most of the earthworks and structures were constructed for two tracks at Fowler’s insistence. 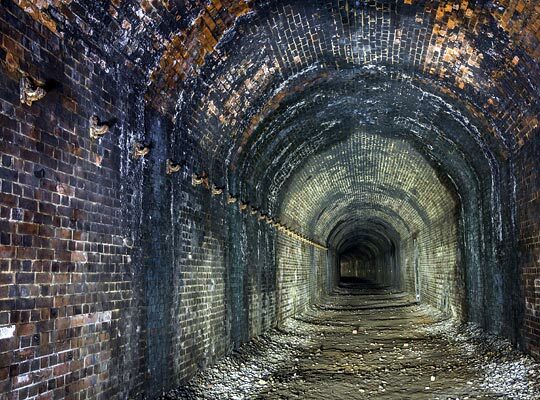 Work got underway in August 1858, the intention being to complete the line in two years. However unstable ground conditions caused delays, resulting in several landslips and, in one case, the need for a diversion. Significant engineering works were demanded, including Victoria Bridge at Arley with its 200-foot cast iron ribs, several viaducts and three tunnels at Mount Pleasant, Knowlesands and Bridgnorth. These were all progressed under the supervision of Resident Engineer Henry Bridgeman. 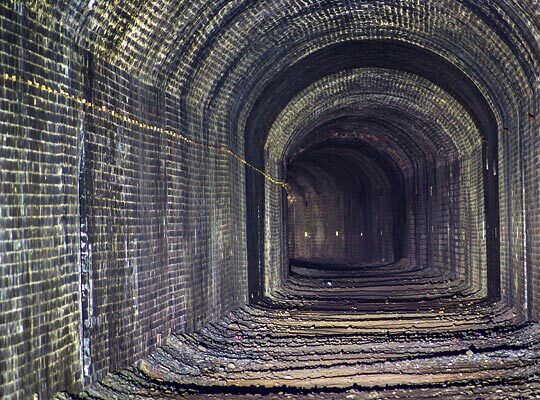 The longest of the tunnels extended for 559 yards under Bridgnorth, the south portal being about 400 yards beyond the town’s station. As trains entered, they curved to the east on a radius of 20 chains, before encountering a short straight section. A westerly curve took over as daylight approached at the north end, the radius being 30 chains. Laying out the tunnel proved challenging as a consequence of this S-shaped alignment; things were not helped by the hill above being covered in buildings. Mr Dowell, the engineer and agent to the contractor, established datum points at High Rock and Oldbury - either side of the town - which could be viewed from an observatory built on the roof of the Castle Hotel. 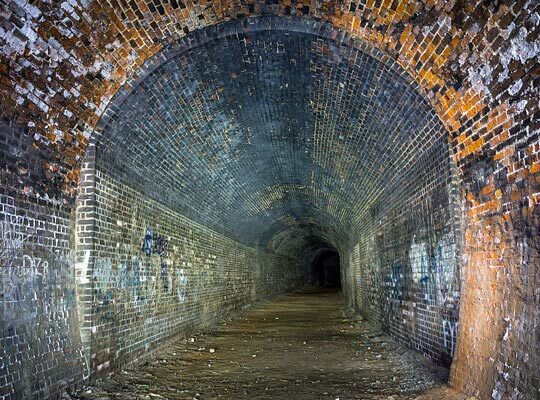 The contract stipulated that the tunnel must be driven from its ends only - without shafts - but the council relented on 6th May 1859, allowing a single shaft to be sunk in the High Street, 20 yards south of the Town Hall. It is indicative of just how quickly progress was made that, on 2nd September, a junction was made between the headings from the shaft and the south end. No perceptible deviation in either line or level could be detected. As soon as the last shot was fired, Dowell climbed through the hole and ascended the shaft into the High Street where a cheering crowd had gathered. The miners were treated to ale at the Ball Inn and rockets fired in celebration. Dowell immediately ordered that the Blow George - a mine ventilation device - be shut down in order to silence it, no doubt much to the townsfolk’s relief. 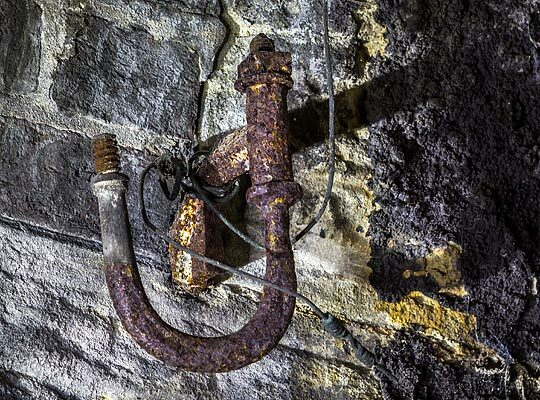 Instead permission was given for a three-inch pipe to be installed within the shaft, carrying foul air from the workings, across the road and up the wall of the Town Hall. Construction of the tunnel proceeded with little incident. However, in November 1859, a ganger named Grindley was severely injured by a rock fall as he was engaged in mining operations. 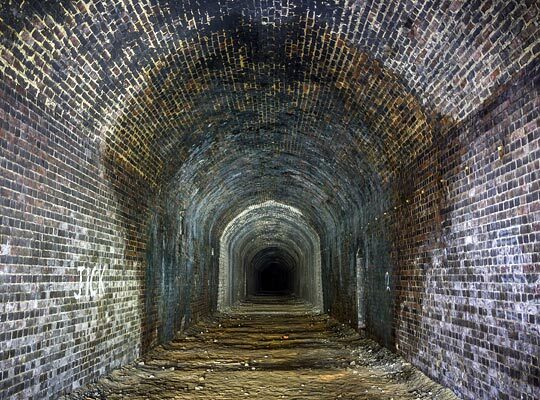 And late in November 1860, the tree-covered slope above the northern entrance gave way, resulting in the tunnel partly collapsing and being choked with soil and rock for a distance of about 50 feet. No-one was injured, the workforce having departed an hour earlier. Although a serious setback, Dowell confidently predicted that four men could repair the damage in a fortnight. Colonel Yolland inspected the line for the Board of Trade on 30th December 1861 and again on 15th January 1862, declaring it fit for passenger traffic. The first official train traversed the route on 31st January; public services were introduced the following day. This was nine months later than expected, a function of remedial works associated with the various landslips. 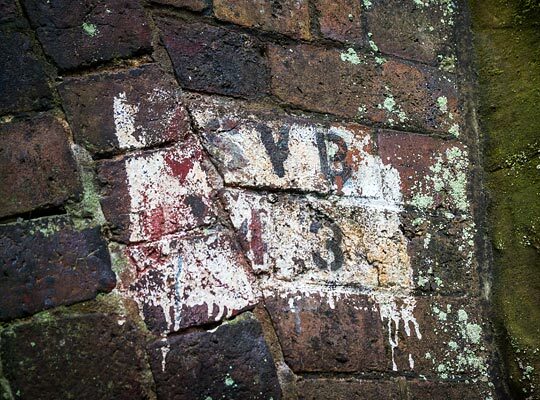 Bridgnorth Tunnel, structure number SVB/43, was driven through red sandstone. On examination, Yolland reported that only its roof was brick-lined, the arch presumably springing off ledges cut into the rock. But it was subsequently relined at least twice. The latter occasion stemmed from a recommendation of the Great Western Railway’s Engineering Committee on 17th March 1911, the total estimated cost being £4,078. 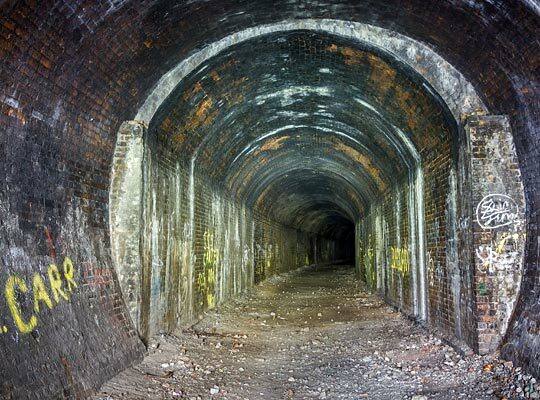 As built, the tunnel was 16 feet 8 inches wide at the south end, 19 feet wide at the north end and 16 feet high from track level to soffit. 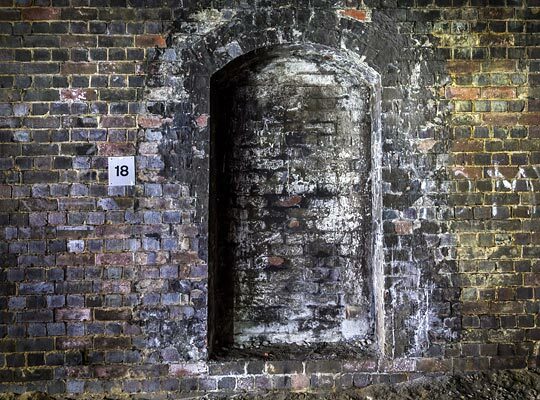 The 1911 relining - using engineering brick to insert vertical sidewalls and a segmental arch - reduced the width to 15 feet, except for a few yards at each end which retained a horseshoe profile in red brick. 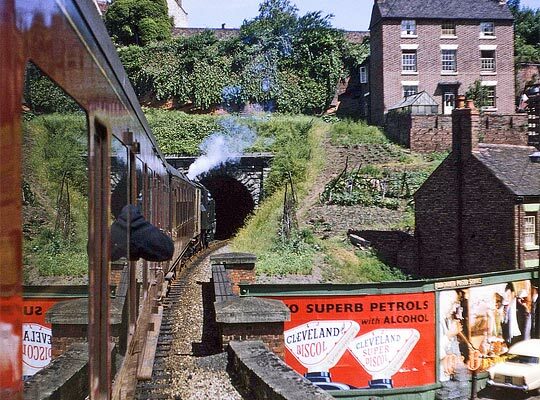 Passenger traffic along the route started to dwindle after World War II and it was closed to through traffic on 9th September 1963, resulting in the track north of Bridgnorth - including the tunnel - being lifted. Bit by bit, the rest of the line succumbed during the 1960s, apart from a short section which continued to carry coal to Ironbridge Power Station until November 2015. Preservationists started to take a practical interest in the railway in September 1965 when working parties were organised to carry out general housekeeping activities. With British Rail’s permission, ballast was recovered from inside the tunnel. Heritage operations got underway in 1970, initially connecting Bridgnorth to Hampton Loade, before extensions were built to Bewdley in 1974 and Kidderminster ten years later. 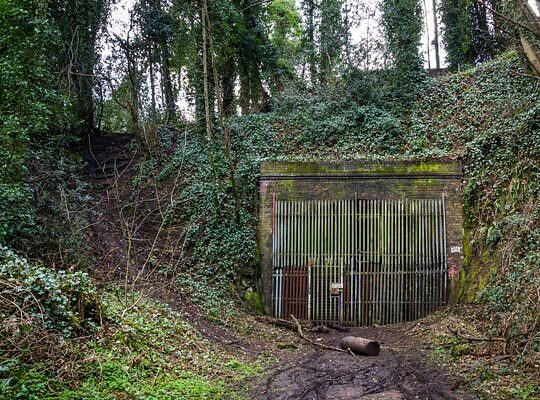 Plans to push northwards - through the tunnel - were put forward by groups within the Severn Valley Railway in the mid-1970s, resulting in the SVR being offered first refusal on the tunnel by British Railways Board (Residuary). However the scheme was deemed impractical and the structure remains part of Highways England’s Historical Railways Estate. 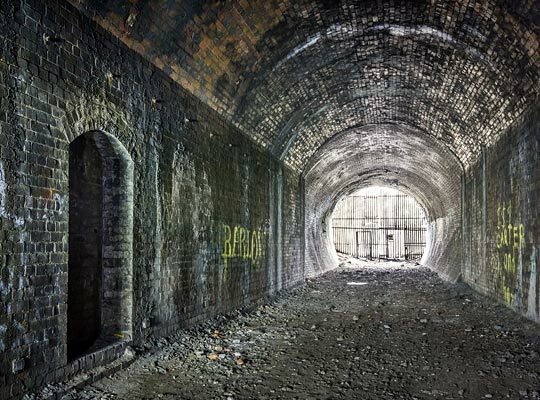 Today Bridgnorth Tunnel is in generally good condition, although it does suffer from localised brickwork spalling particularly in the short, older sections at either end. 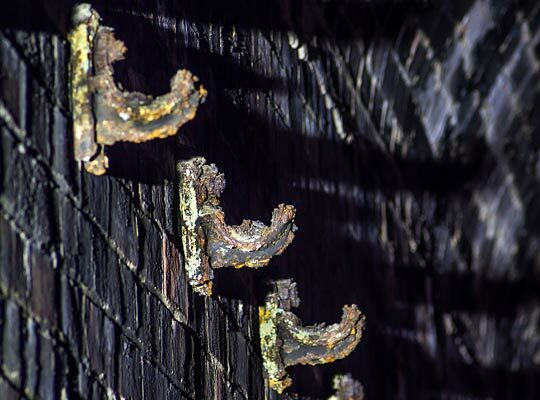 A lengthy row of cable hangers has evaded salvage high on the west sidewall, whilst several timber identification plates remain in situ above the refuges which alternate from one side to the other. There is no structural sign of the shaft but its location, 240 yards from the south end, is wet, unlike the substantial majority of the tunnel. The north portal is brick-built, comprising little more than a small headwall. A four-brick arch ring face is visible. Surrounded by ivy, it is found at the end of a deep approach cutting which falls away to the east. Considerable security arrangements have been established. Access to the south end is now difficult as the portal sits in a private garden. It is constructed in stone and features small triangular wing walls. Click on this icon for more of David Rostance's pictures.